I love baked oatmeal. 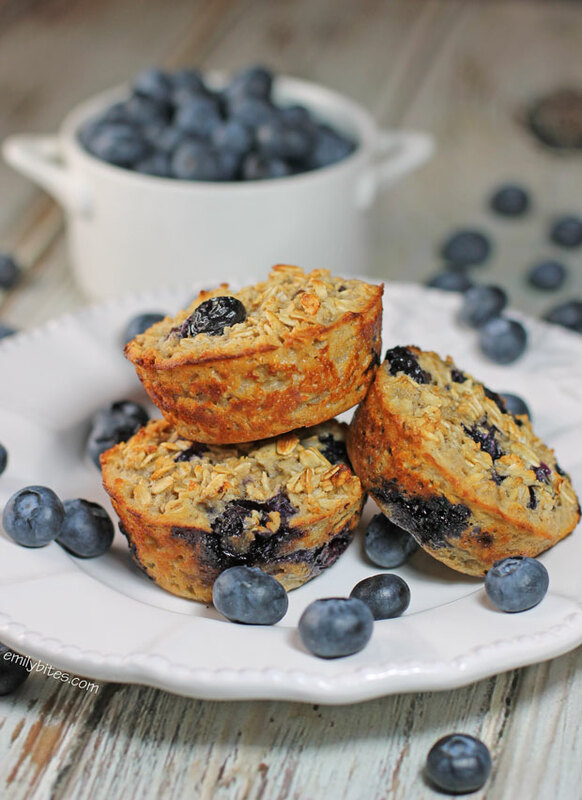 I’ve made a lot of types since discovering its existence just a few short years ago, but these Blueberry Baked Oatmeal Singles are definitely one of my favorites. They’re so easy to make and it’s great having a hearty, filling, healthy grab-and-go breakfast all week long. I love the lightly sweet oatmeal and the bursts of juice blueberries. My husband gushed about the Pumpkin Chocolate Singles I made, but now he says he likes these ones even better. We have a winner! 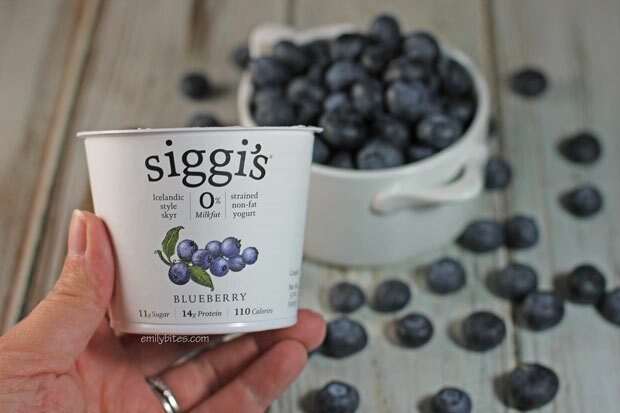 I was really excited that *siggi’s wanted to work with me on a post, because I absolutely love their yogurt and I often eat it for breakfast, a snack or as part of my lunch. What’s Icelandic-style yogurt (called Skyr)? Well, it’s made from adding live active cultures to skim milk and then straining it to make super thick, creamy yogurt that is naturally fat free and contains 2-3 times the protein of traditional yogurt. One of my favorite things about siggi’s is that every container has more protein than sugar (and no artificial sweeteners), unlike a lot of fat-free products that replace fat with sugar. The result is a lightly sweet and fruity yogurt with a super thick consistency I want to eat all the time. They have a lot of fun flavors and the blueberry worked perfectly in this recipe. If you’re looking for other ways to cook with siggi’s they even have a recipe section on their web site as well as a store locator so you can find where to buy it near you! Looking for more baked oatmeal recipes? Try Banana Chocolate Chip Baked Oatmeal Singles, Apple Cinnamon Baked Oatmeal Singles, Pumpkin Chocolate Baked Oatmeal Singles, Chocolate Cherry Baked Oatmeal Singles, Pumpkin, Cranberry & Apple Baked Oatmeal or Blueberry Peach Baked Oatmeal! In a separate bowl, whisk together the egg white, egg, yogurt, milk and vanilla. Add the wet ingredients to the dry ingredients and stir until blended together. Stir in the blueberries. *siggi’s rather delicious yogurts with simple ingredients and not a lot of sugar. Try delicious flavors like vanilla, pumpkin & spice, and mixed berries & açai, power up your breakfast with their recipes and print a coupon. Couldn’t find that brand, or even kind of yogurt anywhere! 🙁 But, I did make these and just subbed the Dannon Light and Fit Greek Bluberry yogurt (80 calories) instead. They turned out great – eating them now! Love your recipes! Finally had the opportunity to bake these yesterday. 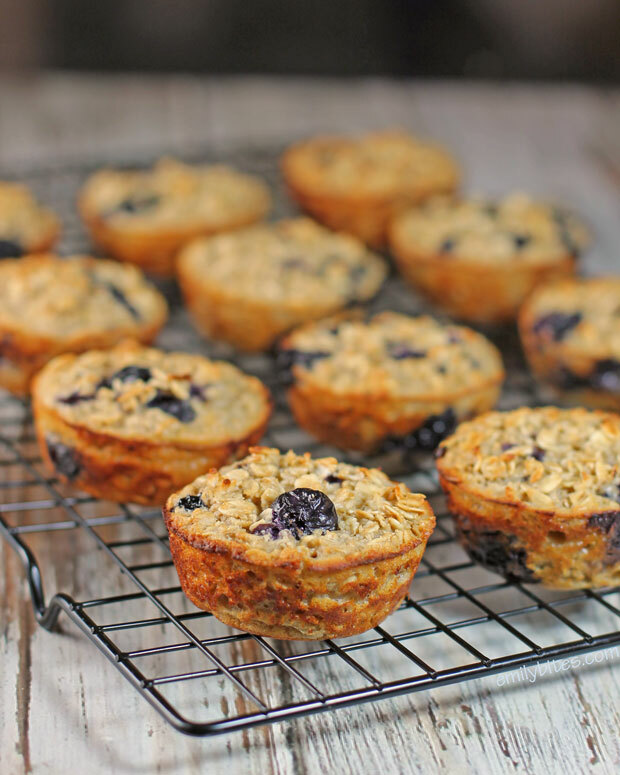 These are by far my favorite baked oatmeal single recipe. So delicious! Would quick oats work on these? I bought oats at the store the other day and just realized they were the quick oats and not old fashioned! If not I’ll just buy the old fashioned ones but I thought I’d check.. Thanks! Honestly, I’ve never tried it using anything but old fashioned oats so I really can’t say for sure either way. If you try it out let me know! Made this with lemon Greek yogurt and they were yummy Thanks for converting some of the recipes to smart points., that’s how I found your site. how do you store these after you bake them? do you put them in the refrigerator or leave them out on the counter? I made these exactly as the recipe states and to the ‘t’ and they came out rubbery and not so good. I’m trying to figure out what I did wrong. I love all of your recipes anyways. Is the batter supposed to be very watery? Did anyone else have any issues? I had similar results, a tad too wet inside even though the toothpick came out clean. So I left them on the counter over night and they were perfect in the morning. I added a 1/4 cup of almond slivers and almost doubled the blueberries. My family really liked them. Are these mini muffins or regular size? These are delicious! I had a similar issue with the bottom not being done. I just took them out of the tin, flipped them upside down, and baked them at 350 on a cookie sheet lined with parchment paper. Worked out great! These are super yummy! These are DEF yummy, but I need to figure out how to get the bottoms “done”. I flipped them over and cooked them too, but they were still pretty smushy. Made these today and they are delicious! Took them out at 22 minutes but were a little too moist inside. Put them back in for 3 more minutes then let sit on cooling rack for 10 minutes. Perfect! Thanks for another great recipe Emily!